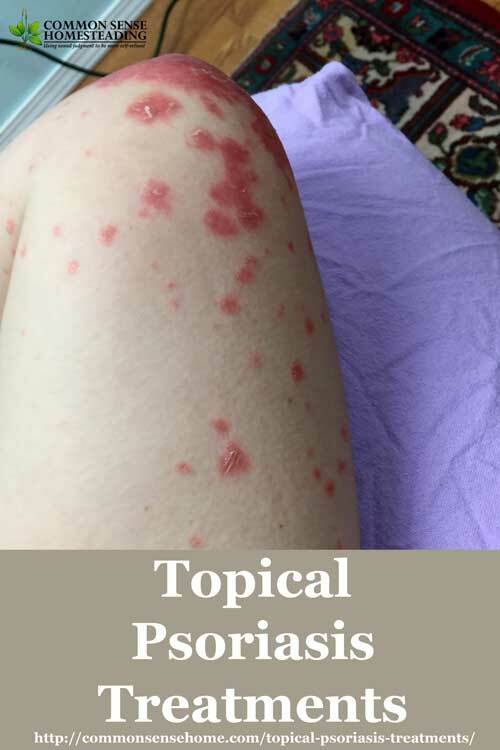 I'm going to talk about topical psoriasis treatments, even though I found that in my case, until I changed my diet, topical treatments were only minimally effective. Even the pricey stuff prescribed by the dermatologist only took the edge off – but it did do that, and that bought me some time to make the changes that really addressed the underlying problems. Early on I experimented with a variety of over the counter psoriasis creams, homemade herbal creams and essential oil creams, and different creams I could buy online. Now I take a soothing bath one or more times a week, and spot treat with just a couple of things that work well for me. I'll go through the options by category. The list of recommended skin care products given to me by the dermatologist looked like a shopping list made up by Proctor and Gamble. While I do think it's a good idea to eliminate toxic skin care and personal hygiene items, I didn't believe that this was my problem. I use very few products, and what I do use is non-comedogenic and non-toxic. If this is not the case for you, you may want to change your skin care routine. Some of these are available over the counter (just hunt around at your local pharmacy for “psoriasis creams”), some of these are prescription only. Some of these can't be used in combination because one inactivates the other. Read labels, check with your doctor. Phototherapy is typically administered for stubborn cases or cases that cover a large area of the body. Psoriasis is treated with either UV-B (Ultraviolet B) or PUVA therapy. As a therapy, these treatments are administered by a physician (although home UV units are available), but many people find their psoriasis improves with more exposure to plain old sunlight. One of the treatments that I have used and continue to use occasionally is petroleum jelly. While not a preferred option, it's one of the few things that coated the cracking without causing more pain when my skin was really bad. This was a particular problem on my elbows. When I asked at the doctor's office why they recommended it, the assistant said, “Because no one reacts to it.” Fair enough, and true in my case. I was hoping that my hard lotion bars would work for my psoriasis, but they didn't. I suspect that there may have been residual honey in my minimally processed beeswax that fed the yeast, but I'm honestly not sure. Whatever the case, applying the hard lotion on my active outbreaks made them worse, not better, leading to oozing and itching. Friends of mine sent an assortment of herbal salves and ointments, and I tried some of my own, including plantain, comfrey, neem, dandelion and jewelweed. No luck for me, but perhaps your results will be better. I tried my friend Gaye's essential oil Miracle Cream with roller ball psoriasis add on that she uses for her husband. It made me constipated. Sorry if that's TMI. I have to be very careful with my use of EOs. The two oils that I have been able to use successfully for psoriasis treatment are coconut oil and tamanu oil. Both of these oils have anti-fungal properties, so they are a good fit not just for soothing the cracked, dry skin of plaque psoriasis, but for treating the underlying candida overgrowth. My weekly soak has been a source of great comfort. I also soak after BodyTalk sessions. I've read a number of stories of people who vacation by the ocean and found that the salt water cleared their psoriasis. When soaking, use warm water, not scalding hot, which can dry and irritate the skin. Several sites suggest 15 minutes, I tend to soak a little longer. If I'm going to go to take the time to fill the tub with warm water, I'm going to make sure I make full use of it. In addition to warm water, you may also find it helpful to add Epsom salts and/or Dead Sea salts to your bathwater (I add both). Oatmeal is a well known skin soother. You can buy finely ground preparations, such as Aveeno bath treatment, finely ground your own, or just put some oatmeal in an old sock and squeeze the milky oat liquid into the bathwater. Some people add a small amount of oil to the water, but if you choose to do this, don't use so much that you clog your pipes, and be careful not to slip getting out of the tub. You can also brew an herbal tea using chamomile, plantain or oat tops, and add the tea to your bathwater. Use about 1/4 cup dried herb in 4 quarts of boiling water. Let steep for at least 15 minutes, strain and add to bathwater. Those are the bulk of topical treatments that I've tried for my psoriasis. There are a ton of treatments out there, and I have by no means tried them all, so if you have a particular product that you have found works well for you, I'd love to hear about it. Today's photo update. Most areas of my body are pretty clear, except the elbows, which are much improved but not totally clear. 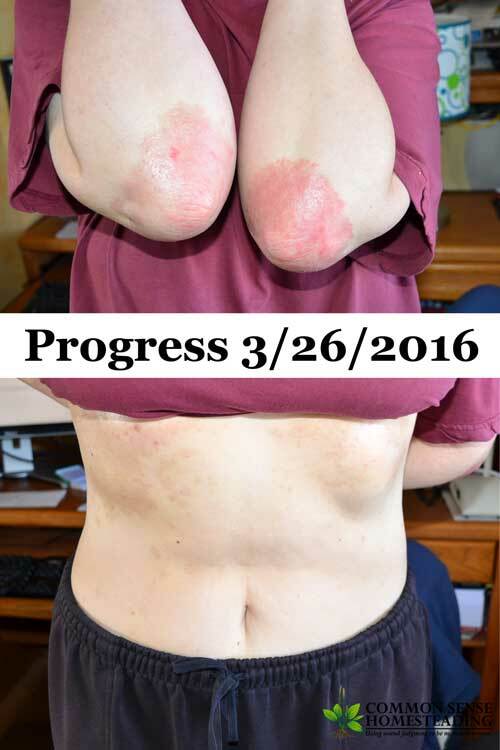 I am so glad to hear that all of you are feeling better, and that your psoriasis is MUCH improved, Laurie! I hope you continue to improve and are able to be psoriasis free very soon. Also…..thanks for the cinnamon roll recipe. And thank you for continuing to send your wonderful newsletters. Happy Easter to you and your family. Thanks for your kind note, and happy Easter to you and yours, Jean. Hi Laurie, Firstly, many thanks for your very informative and interesting newsletters. I really don’t know how you find the time to do them, even when you are feeling under the weather but I’m thankful that you do. I always keep an ear out for anything skin related as we have had various issues over the years in our family, mostly eczema and rosacea and I came across something I thought may help you. I don’t know if you’ve heard of Black Seed Oil, from cold-pressed seeds of the Nigella Sativa plant, a common garden plant, well, here in the UK anyway. From what I’ve been reading, there doesn’t seem to be much it can’t alleviate, from minor to major complaints. I have just bought my first bottle to try improve various complaints, the most troublesome of which is knee and hip pain. Anyway, only received the oil two days ago so I don’t have anything to report other than I was able to do a three mile walk yesterday with virtually no pain – could just be mind over matter but if it works ……. I bought mine from Amazon but any good health shop should stock it. One word of warning though, although it smells quite nice, it really has the most disgusting taste EVER! I will persevere but next time, I will buy capsules. Must find a way to bypass the tastebuds. Various people have suggested mixing it with honey but I’d rather just swallow it asap. Yeuuch! I have heard that black seed is supposed to be excellent for many different conditions, and even ordered some to try growing in my garden this year. I grew black seed cumin in Madison. I think this is the plant you are discussing. The instructions I got were to plant and protect from sun until it germinates. As I recall it, I covered the row with a fairly narrow strip of cardboard and resisted the temptation to peek for a few days. Cute little flowers, It yielded a lot of seeds, but it would take many rows of it to produce a very modest amount of oil. I’ve used black seed oil, which tastes like an especially aromatic, smoky cumin oil. It can be used as a taste boost along with your regular salad oil Pretty concentrated. I have heard that it is therapeutic. It is strong, and affects me as liver detoxifiers often do: gentle clean out the next morning. Herbalists often recommend that it not be used on a long term basis. Neem and oregano oil have similar precautions. With intestinal-related issues, probably a good practice to alternate, intersperse, keep those predatory microorganisms from becoming immune to treatment. only thing that cleared her up and keeps her clear. It is worth a try. They have it available from our Frontier buying club. I’ll give it a try. 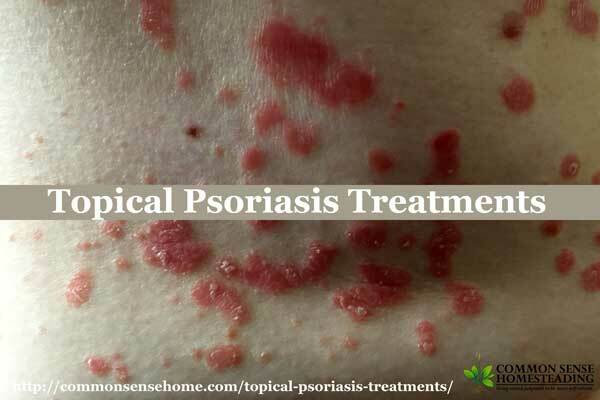 I suffered from psoriasis as a teen and young adult and then later in life from exczema. I took Dr prescribed meds. The only thing that worked for me was giving up wheat. I also discovered that I was gluten intolerant a few years ago. I now avoid most grains and am mostly paleo. When I cheat, I notice my skin gets itchy and if I push the envelope, I have a flare up. It is difficult to give up the foods I grew up on, I am Polish on the maternal side. I miss the baked goods, dumplings and pierogis but giving up grains is totally worth it. When I talked to my sister this weekend, she asked if it was hard to change my diet. My response – not as hard as living in pain. I know honey can be brewed into an alcoholic beverage, but it is still discussed as an antifungal, and it is the only sweetener I can use regularly and in quantity. I did try to use on for what I now believe was contact dermatitis. It might work for an infection, but didn’t seem do much healing on my rash. The bee product I did find helpful was Bee Rescued Balm, a combination of sweet almond oil ,coconut oil, and a little beeswax, a small amount of propolis as well as some essential oil and neem oil. Neem and lavender oil usually irritate my skin, but in this formula, there didn’t seem to be any harm. This proved very protective for the contact dermatitis that ravaged my face this winter. I used gobs of it until the contaminants were pretty well cleaned up and now use a little, which I have done for several years to protect my skin from cracking in extreme cold. Interesting. That’s one option I haven’t seen recommended before. I have very sensitive skin and skin allergies, and my dermatologist recommended the Made from Earth Aloe Jojoba Lotion. Its wonderful, thick and creamy, and really soothes dry, damaged skin. If you’ve got psoriasis or exzema, this is for you! I’ve had a hard time finding a lotion that doesn’t make me break out in a rash. Love this!